Also, the product includes bonus indicators of the current spread and ask/bid prices in large text, color coded as price changes. 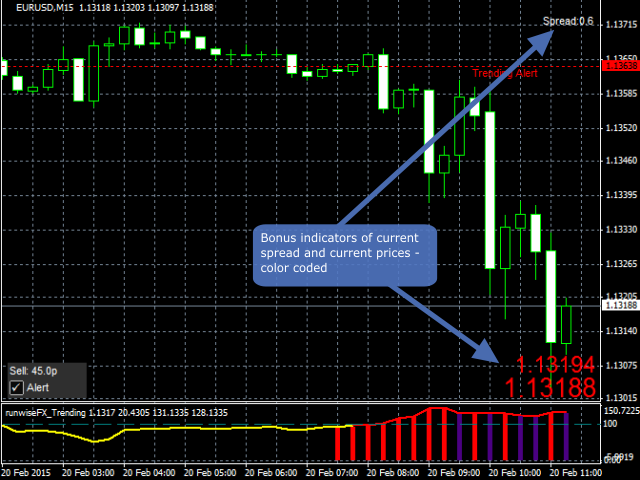 Trade entry should be made when the indicator line is above the 100 level, i.e. not yellow, and the vertical histogram bars are present and of the same color. The histogram bars appear when the direction is confirmed. If purple, then the direction is confirmed but the trend is weakening. Green color signals buy/long and red signals sell/short. 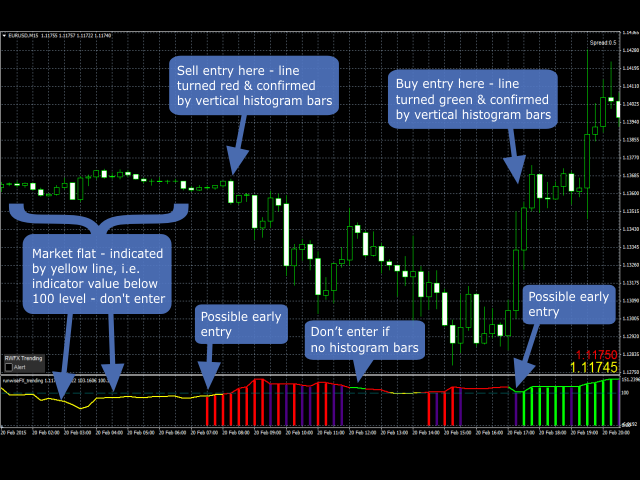 Do not open a trade if no histogram bars are present. Early entry: An early entry could be considered if either the green/red vertical histogram bar is present but the indicator line is still yellow, or the histogram bar is purple but the indicator line is above 100, i.e. colored green/red. The optional alert is controlled via the chart tick box, by default shown on the bottom left of the chart. The alert will be raised when the market transitions from flat to trending. 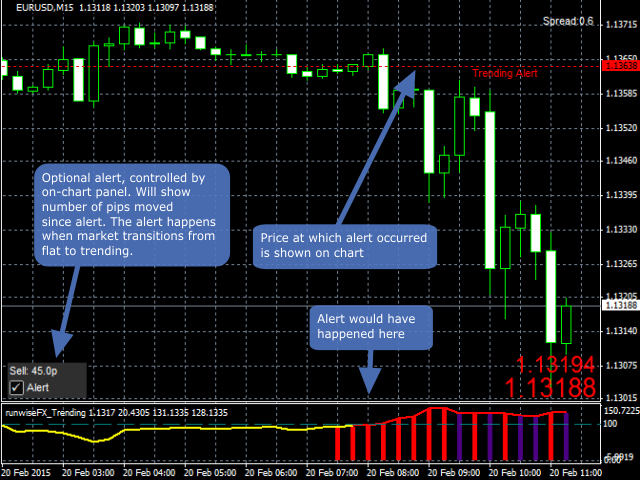 The number of pips since the alert was raised is shown in the panel. The alert can be set to pop-up, play wav file sound, email or notification. A bonus spread indicator will show the current spread, which can be configured to change color if the spread has gone too high. Also, current ask/bid prices can be shown in big text. The prices will be colored green if gone up, red if gone down or yellow if stayed the same. The indicators are optional and fully configurable. - Fixed issue with two color buffers, meant for internal calculations, being shown on chart depending on chart background color.